MoneySmart Exclusive: Get up to 65,500 KrisFlyer miles! Get 5,000 KrisFlyer miles upon first S$1 spend. Only customers new to Amex-SQ co-branded cards will be eligible for this 5,000 KrisFlyer Miles. Receive 5,000 KrisFlyer miles upon first S$1 spend. 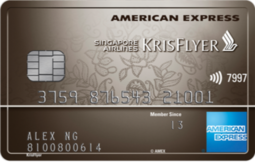 Only customers new to Amex-SQ co-branded cards will be eligible for this 5,000 KrisFlyer Miles.